This world lost a great figure last night when Billy Graham passed from this earth to his heavenly home. Dr. Graham was 99 years old. I’d like to honor the memory of Billy Graham, not only for who he was, but to give glory to the Person who made him so–the Lord Jesus Christ. I had the privilege of meeting Billy Graham in person a few times during the 1980’s. My most special memory was having lunch with him and Loren Cunningham and two other friends just prior to his D.C. crusade in 1986. We met at a restaurant near the crusade venue and enjoyed a hour or so together over lunch. Dr. Graham was easy to be around and shared a trait that most great leaders possess–he didn’t talk about himself but seemed very curious about the needs and lives of those at the table. I was impressed–and grateful for the opportunity. Billy Graham was one of my heroes. Before I share some of the traits that I admired in him, here’s a quick bio to help put his life into historical context. Billy Graham was born Nov. 7, 1918, in Charlotte, N.C., and raised on a dairy farm. He graduated from Wheaton College in Wheaton, Ill. – the current home of the Billy Graham Center Museum and where he met his wife, Ruth McCue Bell, the daughter of a missionary surgeon to China. They were married for over 60 years until Ruth’s death in 2007. He personally gave his life to Christ during a crusade meeting in Charlotte, North Carolina in 1934 led by evangelist Mordecai Ham. That was a night that impacted the world. Billy Graham went on to preach the Gospel to more people in live audiences than anyone else in history. 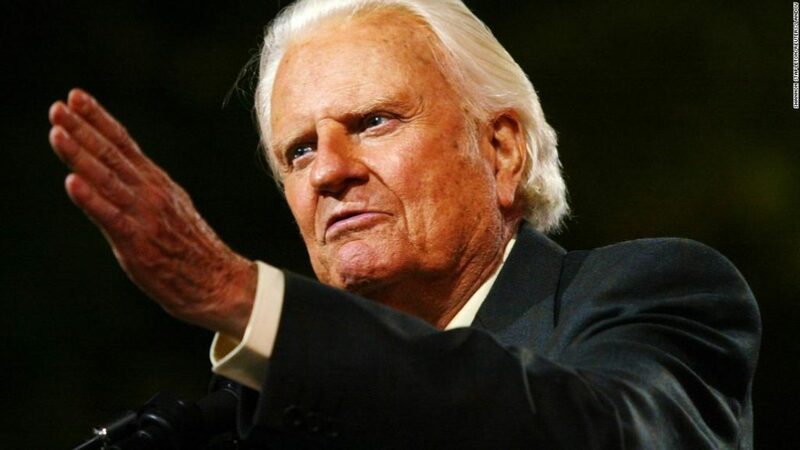 The Billy Graham Evangelistic Association estimates that he preached live to nearly 215 million people in more than 185 countries and territories, and hundreds of millions of more people through television, video, film and webcasts. He led hundreds of thousands of individuals to make personal decisions to commit their lives to Jesus Christ. He certainly impacted my life with his witness. Following are some of the qualities that I most admired about him. First, I deeply appreciated his humility. Though he probably shook hands with and knew more heads of state and VIPs than most people in history, he possessed a down to earth quality about him that made him very approachable. Maybe it was his farm roots and blue collar background. But the higher he rose, the personal humility stayed the same. Part of his humility included his willingness to admit mistakes and learn from them. He regretted later in life his lack of involvement in the civil rights marches of the 1960’s saying, “I should have gone to Selma.” He was also deeply sorry about his undiscriminating relationship with former president Richard Nixon who was exposed during the Watergate revelations. Graham repented for his naivety and vowed to never make that mistake again. He continued to advise and counsel many presidents and world leaders, but with a closer eye to not condoning bad behavior. Second, he mentored two generations of Christian leaders in moral purity and integrity. Early on in his public career, he made a decision to never be alone in a room with a woman not his wife so that his testimony would be above reproach. When he traveled and stayed in hundreds of hotel rooms during his seventy years of evangelistic work, he always placed associates on either side of his own room–so that his virtue and integrity as a follower of Christ would not be sullied. In today’s world of #MeToo and with the revelations of sexual assault and improprieties mushrooming daily, Dr. Graham’s principles stand out as a shining light. He not only didn’t assault or prey on women, he went out of his way to avoid all appearances of evil. Vice President Mike Pence recently said he practiced the same principles (learned from Billy Graham), and people laughed at him. In today’s environment of debauchery, should anyone be snickering? No. They should be grateful that Billy Graham raised the bar for generations of leaders. Third, Billy Graham knew who He was . He understood God’s call on his life. Due to his high profile notoriety, he could have dabbled in politics, business, and many other ventures. But he was ordained by Jesus to be an evangelist–and stuck to that mandate like a laser. (His son, Franklin, follows his father’s example when, in every interview, he shares the truth of John 3:16). Finally, the Rev. Dr. Billy Graham knew the simple message God had given him to share with the world. It was concise, powerful, and true. “You must be born again” (John 3:7). No man in the history so focused on those five important words. I, for one, took them to heart and found salvation in Jesus Christ in 1968. So did many others. Jesus gets the credit for the laudable life of Billy Graham. Now it’s our turn to be faithful, and bring honor and credit to Jesus, the Savior of the world. That’s where it all begins. Heard him at a Seattle crusade in early 70s, and many times on TV. He was old school, but not ashamed of the simple Gospel. Rather similar to The Jesus Movie: good old-fashioned, no frills, clear presentation that never goes out of date or obsolete, and needs no light show or smoke to impact people of all backgrounds. What a legacy!!!! Beautiful tribute to a man who served Jesus and is at rest in his presence now. I went forward in a Billy Graham meeting in 1959. I had never heard the gospel before….